The National Great Blacks in Wax Museum opened in 1983. It was set up by Drs. Elmer and Joanne Martin as a cultural and educational institution that focusses solely on the study and preservation of African American history. 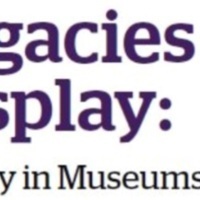 It is a unique organisation as it represents the histories it interprets through the use of life size wax figures, presented in historical settings. The museum has several objectives, including to increase interest in African American history, to use inspiring examples from history to motivate young people to achieve, and to improve race relations by dispelling myths of racial inequalities. The museum attracts around 300,000 visitors annually. The museum features thirty-five installations of 'great blacks' in a range of scenarios. These cover a large temporal and geographic span, beginning with representations of key figures in pre-slavery Africa, through to dioramas of the space race and modern science. The key focus is on black achievement through all sectors of society, including politics, the military, sport and business. Many of these installations link to the history of slavery in the United States. They examine the Middle Passage and captivity, plantation life and resistance with graphic displays of the instruments of brutality utilised in the system of enslavement. Others depict key characters in African American journeys to freedom including Henry 'Box' Brown and W.E.B. Dubois. The abolition movement is incorporated into the installations with the characters of Frederick Douglass and Sojourner Truth. The Underground Railroad is also depicted in a display with Harriet Tubman, amongst others. Many of these dioramas also incorporate models of children. The displays continue to chart the twentieth century, examining the Civil Rights Movement, Black Power, and the Jim Crow Laws. Some of these dioramas illustrate the abhorrent nature of the racial violence that dominated the United States, such as lynching, in graphic detail. 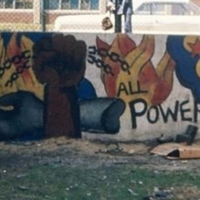 In 1969, in the courtyard of Saint Dominic’s Church in Cabrini-Green, John Pitman Weber painted All Power to the People with a team of black teenagers. 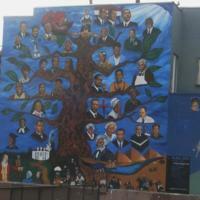 The 37-foot-long mural put the antislavery leader Frederick Douglass alongside Malcolm X, Huey P. Newton and Erika Huggins on the right-hand-side. On the left are skeletons of police officers and a statement by the leader of the Chicago Black Panther Party, Fred Hampton: "Dare to Struggle, Dare to Win." A raised Black Power fist, enveloped by flames, holds broken chains in a symbol of self-emancipation. A few months after the creation of this mural, Fred Hampton was shot and killed by the FBI under J. Edgar Hoover’s COINTELPRO. Weber was a white Harvard graduate and Fulbright scholar. 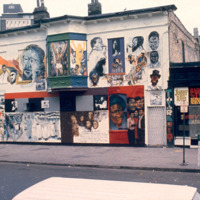 The mural was one of the first collaborations between untrained community residents and a trained artist, a method that became common practise for American community murals. In 1991, a group of artists – Eddie Orr, David Mosley, William T. Stubbs, Norman Maxwell and Michael McKenzie – collaborated to paint “Black Seeds” on an empty wall in Leslie N. Shaw Park on Jefferson and 3rd Avenue in Los Angeles. The idea for the mural, which appears as an African American tree of life, came from Vietnam veteran and local activist Gus Harris Jr. He recalled how little he learned about African American history in school. He wanted to create a public mural about black individuals who made an important contribution to society.The mural was created under the Social and Public Art Resource Center's 1990-91 “Neigborhood Pride: Great Walls Unlimited” mural program and features the antislavery leaders Harriet Tubman and Frederick Douglass, as well as Booker T. Washington, Thurgood Marshall, Mary McLeod Bethune, Malcolm X, George Washington Carver, Paul Robeson, Stevie Wonder, Shirley Chisholm, Martin Luther King Jr., and Jesse Jackson. The mural was restored by Moses X. Ball to include Barack Obama after 2008. The original canvas upon which the mural was based hangs in Oaks Jr. Market Corner Store at 5th and Jefferson. Although sharing an address with the famous Wall of Respect, the Wall of Truth was different. Whilst the Wall of Respect exalted black role models, leaders and liberators, the Wall of Truth wove negative scenes of poverty, brutality and racism into the fabric of the urban environment. Rather than promoting racial pride, it highlighted racial disparities. “The intent on the opposite side [of the road] was that things had gone more militant,” muralist Eugene Wade explained: “more blackness was needed in terms of representing the Black Power symbol and the whole thrust of what was happening in the black community.” Wade notes that “people were getting angry and fed up, so what we were trying to do was implement the attitude and the mood. "The Wall of Truth was a significantly larger mural than its Chicago neighbour, the Wall of Respect. It spanned the length of an apartment building, and wrapped around onto an adjoining wall. It contained nine separate narrative panels and was one of the first instances that a radical black past was visualised in the streets through the antislavery leaders Frederick Douglass and Nathaniel Turner, as well as Mary McLeod Bethune, W.E.B. Du Bois, H. Rap Brown, Stokely Carmichael, Marcus Garvey, Huey P. Newton, Fred Hampton, and Malcolm X. 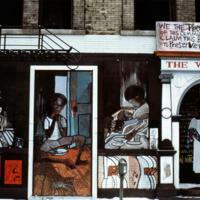 The Wall of Respect was the first exterior African American mural in the United States. Painted by OBAC (Organisation of Black American Culture), it underwent three main phases, as shown throughout the photographs here. Its creation was an inclusive process, asking local residents to decide which black heroes should be included in the mural. This was an integral step in the mural-making process because “any muralist who’s doing anything of a thoughtful nature should always have an input from the community,” artist Bill Walker observed. “You can’t do things that make people think they’re not a part of things.” Compiling a newsletter and consulting local militant street gangs, OBAC wrote a list of historic and contemporaneous figures to be memorialised on the wall, before waiting for their approval. “The militant [members of the community] were the ones that defined who would go on the wall and who would not,” artist Eugene Eda Wade remembers in a 2017 oral history interview. The choices were figures from the past and present who “charted their own course” through life and “did not compromise their humanity,” including the antislavery leader Nathaniel Turner, as well as James Brown, James Baldwin, Thelonious Monk, Malcolm X, Nina Simone, Claudia McNeil, Stokely Carmichael, H. Rap Brown, Elijah Muhammad, Gwendolyn Brooks and Muhammad Ali. By celebrating radical black heroes of the past and present, the mural became a site of black cultural heritage and an unofficial landmark on Chicago’s southside. It also catalysed a national mural movement, with more than 300 murals painted in Chicago alone over the next few decades. In 1971, the mural was destroyed in a fire. 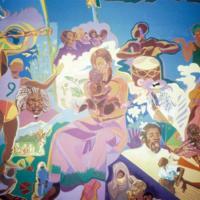 In 1976, the Mexican muralist Manuel Martinez created a mural at Auraria College titled Races of the Student Population. It depicts the antislavery leader Frederick Douglass alongside figures of the Black Power Movement including Bobby Seale, and figures and symbols of the African diaspora.